Allen Ray Freeman is a prolific writer, artist, colorist and small press publisher. The Owensboro, Kentucky, resident has had his work published in Ralph Snart Adventures, Speed Racer Classics, Fright Night and illustrated three videotape covers for Speed Racer videos for Now Comics. He contributed to Morgana X and The Seeker for Sky Comics. He inked The Realm and Frankenstein for Caliber Comics. He’s also worked for Wunderman Comics, KCQ Comics, and Blind Bat Press. He contributed to the Mortal Kombat Card Game and Battlelords Card Game. Allen was also a 3D artist on Front Page Sports Football 97 and 98 (Sierra On-Line) and Crimson Skies: High Road to Revenge (Xbox) Microsoft. In the realm of small press, he has published 44 issues of the amazing Slam Bang anthology and has contributed covers and comics for innumerable small press mini comics, digest comics, and full size comics from 1984-1990, plus a few more from 2003 to the present. He’s also the colorist and letterer on Spudman web comic on Zuda Comics, and served as editor and publisher of the Ralph Snart Adventures Fan Club Newsletter. He’s currently at work as a colorist for LastKissComics.com and continues as the editor publisher of his small press operation, Fan-Atic Press. 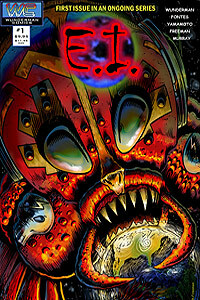 Find out even more about him at www.allenfreeman.net, www.fanaticpress.com, and www.comicartfans.com. 1984. I’d read about other small press comic artists and jumped into the publishing biz. 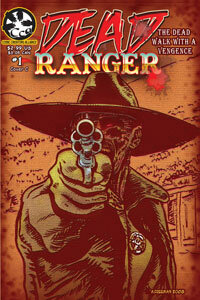 Around 1991 I started creating cover art, plus inking and coloring professionally. My parents always encouraged my drawing ability and helped me go to college to get my BFA degree, leading to my commercial art career. I’ve studied a lot of the famous inkers and tried to follow the style of Joe Sinnott. I owned a Thor page he worked on. I was fascinated with Frank Frazetta and studied his work closely. Elno Swartz was the first professional artist that took me under his wing. He wasn’t a comic book artist but a commercial artist of the highest caliber. He taught me the way to correctly hold a brush; how to use a straight edge tool; how to master an airbrush. He showed me how to work with shades of grey and how to study light and how it hits a surface. He showed me how to be dedicated to my craft. All of these skills I used in commercial art and carried over to my comics work. Look at other comic book artists’ work and go to museums. I take lots of photos everyday of anything that I find interesting. (www.flickr.com/photos/maknbacon) (www.jpgmag.com/people/maknbacon) I’m planning a book of my photos in 2009. I also like to see movies — lots and lots of movies which inspire me. Well I sleep ‘til about 3:30 PM, no lie. Then I get up and wake up, then eventually work from about 6:00 PM till about 4:00 AM the next day. Crazy hours, but I get less interruptions. I pencil the traditional way, then either ink it traditionally with a brush, or scan it in and ink it in CorelDraw. I do all of my coloring in Photoshop CS3. I do my lettering in Photoshop as well. Looking at a finished page after I’ve been intently coloring it for a while. At some point it just all comes together. Most of all, the excitement in seeing the final printed comic book that contains my work for the first time. Working in the gaming field I had the pleasure of being hired by Microsoft and worked on the Xbox game Crimson Skies: High Road to Revenge. It was great to be on the inside of the game making process. I had the game with my name in the credits, and I bought the walk-through manual and it also had all the credits in there as well. Seeing the book for sale in all the bookstores was a high. Before this, I did cover art for Now Comics, and then a few weeks later seeing it in the comic stores was very exciting. Practice, Practice, Practice. Then get feedback on your work from as many professionals at comics shows that you can. Listen and learn. Read everything you can get your hands on as well. Never stop learning. I’ve learned that just about anything that you want to do in life is possible. Sure, it takes dedication and the will to carry on no matter what gets in your way. If you continue to move forward you will eventually get where you want to be. Use all your available “free” time to train your eye and hand and mind to be what you want to be. Never stop trying. Only listen to your heart and don’t listen to anyone that tries to discourage you along the way.